Walk The Plank is amazing game that we were first introduced to at an Arizona summer camp a few years back. While we played on a grass field, the game is great for the beach as well. Before you start, select two (or more) teams with 15 people. Select 7 pairs who will function as the moving plank and one person (the smallest person!) to be the person to walk the plank. Each pair of holders will be on the end of their board (see pic above). Once you say “go,” the walker of the plank will step on each board to navigate the plank. Once the walker has stepped on a pair’s board, that pair will need to move from the beginning to the end of the row. Teams repeat this action until they have crossed the finish line. To stabilize themselves, encourage the person walking the plank to put their hands on the heads of the holders as they move along the planks. If you would like to extend the game, have them go all the way down to a specified location and then back. If you don’t have enough participants, shorten the course and use less boards. 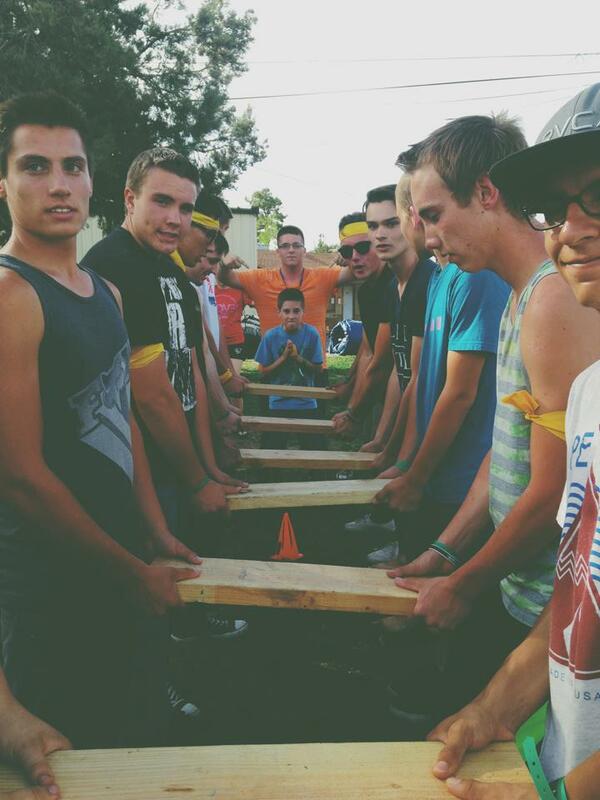 Whatever way you choose, the first team to have someone walk the plank is your victor! Note: Take extra precaution during this game to ensure the safety of the participants. 1. We strongly recommend having additional people to help support the person walking the plank. They can also assist in helping the walker up onto the plank. 2. Make sure that the holders are standing close enough together so that the walker does not fall between. 3. Take video of the game and compile a short video that captures all the action.